This year’s Student Days at ProMat 2017 brought a lifetime opportunity for students Gavin Peterson and Nigel Hammett. 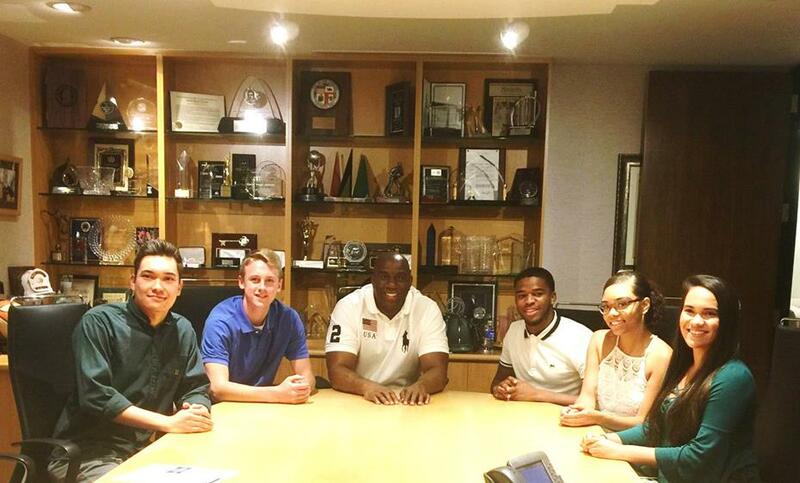 On April 5th, 2017, Peterson and Hammett joined three other high school- and university-level students (Gerard Josse de Lisle, Sara Josse de Lisle and Nepri James) from across the country to shadow Chairman and CEO of Magic Johnson Enterprises and now President of Basketball Operations for the Los Angeles Lakers, Earvin “Magic” Johnson. These students won the opportunity to shadow Mr. Johnson for a day in Los Angeles at Houston Money Week’s Signature ‘100 Teens’ Event (Josse de Lissle, Josse de Lissle and James) and Student Days at ProMat 2017 (Peterson and Hammett). Peterson and Hammett, students at Bryan High School and NCA&TSU respectively, represented the supply chain industry for an incredible day with Earvin “Magic” Johnson. Monday, July 24, 2017 began with Mr. Johnson giving the students a personal tour of the LA Lakers Facility in El Segundo, Ca. Left to right: Gerard Josse de Lisle, Texas A& M University, College Park, TX; Peterson, Bryan High School, Omaha, NB; Earvin “Magic” Johnson, Magic Johnson Enterprises; Hammett, NCA&TSU, Greensboro, NC; Nepri James, NCA & TSU, Greensboro, NC; and Sara Josse de Lisle, Texas A&M University, College Park, TX. 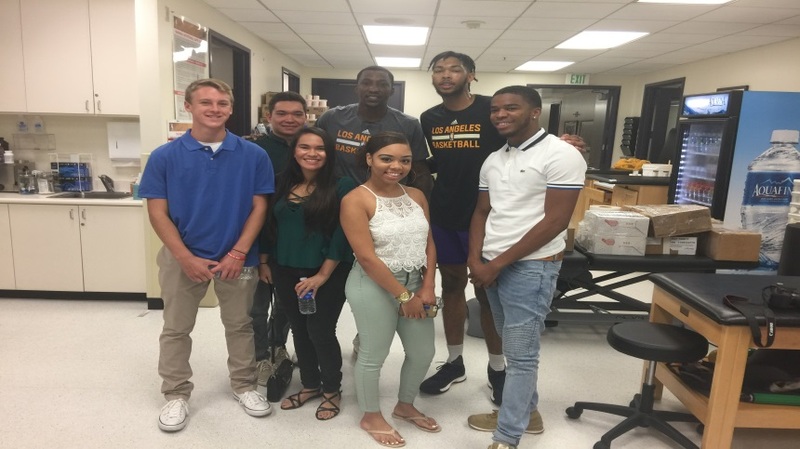 He gave a quick overview of his new role and explained how he was tasked by LA Lakers Owner, Jeanie Buss, to bring change to the organization. He outlined to the students his process of implementing change. This included evaluating everyone’s value to the organization along with prioritizing organizational objectives, because no one person can make everything happen. 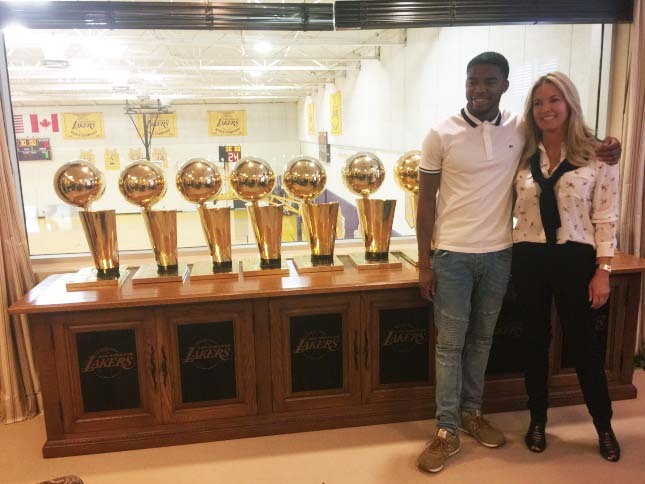 Hammet stands in front of the Lakers Championship trophies with Lakers Owner, Jeanie Buss. Mr. Johnson emphasized how hard work is key to success and is recognized in his organization. He also spoke to three key elements of success: preparation, opportunity and performance. As they concluded the tour, Kent Peterson, Gavin’s father, asked Mr. Johnson to share his recovery method when not successful. Mr. Johnson replied, “You must understand why and make sure not to do it the same way again.” He followed with an example of the loss to the Celtics in a seven game series. He explained that he had to accept responsibility for not playing well, learn from his mistakes and work to ensure it did not happen again. One way he did this was by repeatedly watching the game videos the summer following and evaluating his performance. Mr. Johnson admitted that self-evaluation is one of the hardest things in life. That afternoon, students and chaperones headed to Magic Johnson Enterprises in Beverly Hills, Ca. Mr. Johnson introduced his staff, giving the students exposure to different career pathways outside of and within Magic Johnson Enterprises. The students shared their takeaways with Mr. Johnson and took the opportunity to thank him for his time and the incredible experience. They expressed that the knowledge and wisdom they each gained will prove valuable throughout their future careers. To cap off the day, the students attended a Dodgers game while eating dinner in the Dodgers owner’s suite. View from Dodger owner’s suite. 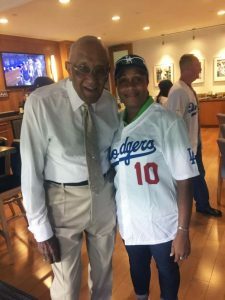 While there, they were honored by a surprise visit from Don Newcombe, MLB pitcher for the Brooklyn/LA Dodgers, Cincinnati Reds and Cleveland Indians. Newcombe was also the first recipient of the Cy Young Award and the National League’s Most Valuable Player. This was truly a once in a lifetime opportunity for the students. MHI would like to thank Mr. Johnson for his generosity and passion for giving to his community. At MHI we understand the value of education and are committed to facilitating the future material handling and supply chain workforce. Student Days will occur again in April at MODEX 2018 in Atlanta and is brought to you by the MHI Career and Technical Education Program (MHI CTE). To find out how you can be apart of Student Days at MODEX 2018 contact Angela Jenkins, Director of Career and Technical Education.